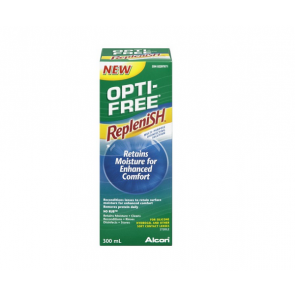 Optifree solution is manufactured by Alcon. The proprietary teargylde reconditioning system works with our tears and creates a layer of moisture that keeps our contacts comfortable all day. Its a multi-purpose cleaning and disinfecting lens solution that reduces harmful micro-organisms that can cause eye infections and provides a cushion of moisture for comfort that lasts from morning until evening . This solution also disinfects against harmful bacteria and is gentle enough for sensitive eyes. It effective cleans by loosening up and removing the debris and particles that cling to your contact lenses. mailmylens has the availability of Optifree solution ex stock.